Batwing CMD's sixth expedition launched to explore the deep black secrets of the US-Southwest was successfully completed early in October 1998. The Swiss part of the team comprised Raphael [T-Bird] Bloechlinger and Meinrad [Swiss Mountain Bat] Eberle. Later on, they got reinforcement by Rohan J. Bourke from Australia, a Pine Gap expert. Fun-factor rating: 10. Flat tires: 1. Road Kill: 0. Best Burgers devoured at Kim Mc Donald's 'Wing & a Prayer' in Lancaster CA. "Dammit, it wasn't even a Firestone tire...!" 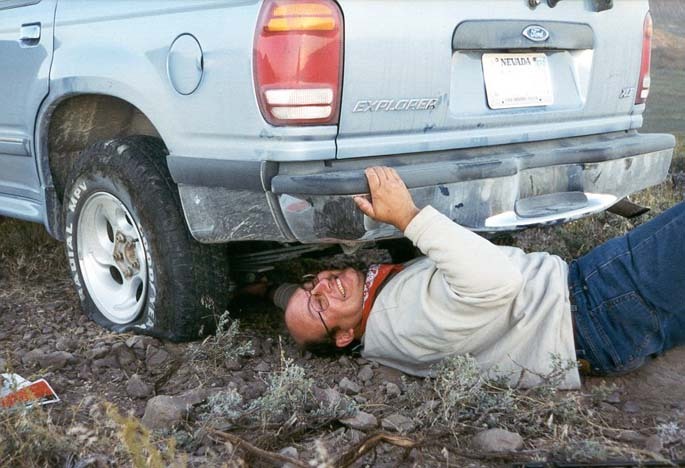 The Swiss Mountain Bat changing tire at his Ford Explorer Expedition Vehicle (EeVee) atop Brainwash Butte near TTR in 9/98, only a few dozen hours after Groom Tower's very own Panic Experience thanks to a silvery radar reflector. The joint Swiss-Australian team observed the event using both Canon 15x45 image-stabilized binoculars and intercepted relevant radio-broadcasts with a Uniden Bearcat 3000 XLT scanner and a tape-recorder while spending 11 hours on the Peak, constantly monitoring both Area 51 and Tikaboo Peak's surrounding airspace. The world's first radar reflective personal location marker which flies, floats, self-launches and requires no power supply or gases. Early into the night, a B-2 Bomber on his way to Tonopah got intercepted while calling Groom: DREAMLAND was the designation he used! Just too bad our tape was not running that very moment. So don't scratch your heads about alleged secret new designations for the Mother of all Bases: At least for B-2s, it's still that good ole DREAMLAND. Now, with reference to exotic crafts probably featuring next century's engines or design features, it MAY be completely different a story. But that's why we'll be back soon, for sure.